Each year I patiently wait for the mango season to arrive. And when my mango vendor calls to announce the arrival of the king of fruits, my heart sings and I literally squeal, shout and jump with joy! I can love no other food as much as the mango. I can eat them for breakfast, lunch and dinner. They can be my dessert before a meal and after. I don’t even have to worry about what to snack or much on when mangoes are in season. I have to look for my mango (which I always soak in water for 1/2 hour to remove the heat from the haystacks), a plate and a knife. I have to simply peel them and gorge! Iqbal bhai, my mango vendor has been delivering at my doorstep, great quality Alphonso Mangoes from the past 5 years. One can find top quality Alphonso mangoes in Mumbai because of the proximity to Ratnagiri and Devgadh, the best mango producing regions in the world. I remember how my grandfather always arranged for mangoes from Mumbai and Pune to be brought to his residence in Bangalore down south. We never ate any other Alphonso mangoes other than from here. I always maintain that mangoes are best relished as they are. But there are a million things one can do with both the ripe and the raw mango. 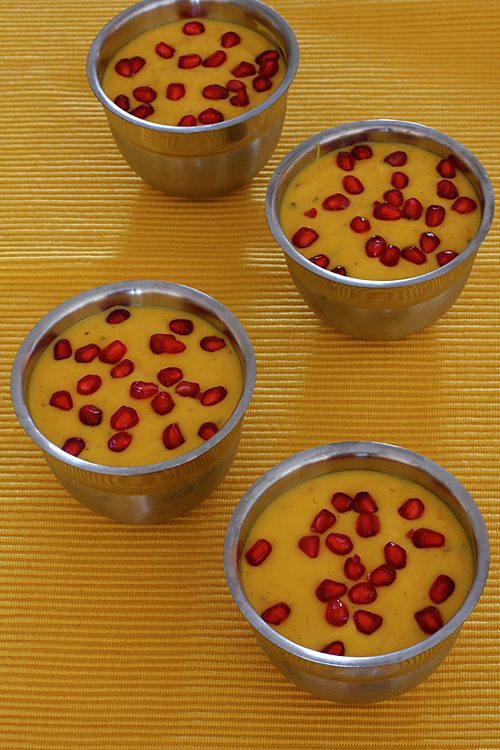 When I was looking to fix something simple, quick and exotic for my parents who were visiting, inspiration struck while reading about gingered mango mousse in Yamuna’s Table. I decided to make several changes, replace the cream with the yogurt and add a vanilla bean to enhance the flavour quotient. When I handed over a bowlful to my father he looked at me with eyebrows raised and asked “this much”? I replied saying "have a spoon, I’m sure you will love it!". All of us at home really enjoyed this dessert and all the bowls were scraped clean. If you are looking for a no fuss dessert that can be fixed in no time and yet look perfect and exquisite and draw oodles of appreciation from your family or guests, then look no further. 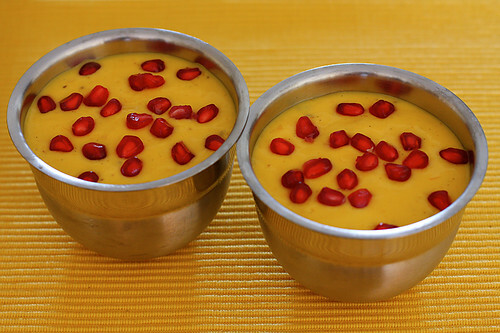 The lusciousness of the mangoes and coolness of the yogurt is complemented by the slight warmth of ginger and mellow richness of the vanilla pod. The sprinkling of pomegranate on top adds crunch and texture to every spoon and also beauty, colour and appeal in terms of a great looking dessert. Seasonal fruits like peaches and strawberries or soaked and cut dried fruits like apricot and figs can be used when mangoes are not in season. I like to use the vanilla bean without scraping the insides as I love to see the beautiful specks lent by the vanilla pod when ground. Peel the skin from the mangoes, deseed and chop them. In a blender or food processor, grind the sugar with the vanilla bean until you get a fine powder. Put in the mangoes and blend until smooth. In a large bowl, with a wire whisk or a spoon, whip the yogurt until smooth and creamy. Stir in the ginger juice and mango mixture and whip until well mixed. Divide and place the mixture in individual bowls. Sprinkle with pomegranate seeds. Chill for atleast an hour in the refrigerator. *Ginger juice- Peel and grate fresh ginger and extract the juice using a lemon press. YUM! this looks so good. im so happy mango season is here! Absolutely gorgeous. Mangoes hmmm. I can only sigh. 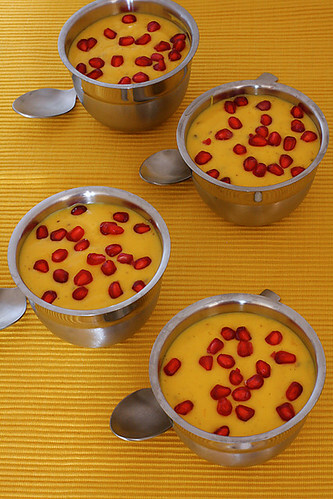 Alphonsoes! The king of fruits! ooh beautiful..this will inspire poetry!!! How incredibly beautiful is this. It sounds absolutely delicious and I can't wait to make it! mangoes and yougurt i think this could become my regular "in between" treat! In between anything i am doing LOL! Lovely recipe – perfect for the warm weather to come! Pics are awesome awesome awesome….Love the clicks and I am already missing the mango season in INdia…All I can get here is some mexican grown fibrous miniscule mango!!! Enjoy!!! Anusruti, first time at your blog, totally loving it. Just perfect for the season! everything I LOVE is in this recipe. Beautiful recipe. I share your feeling about mangoes! This looks truly divine!! Huge fan of your recipes! Can't wait to try this one… However I haven't been able to find vanilla beans around here. Can I use essence instead? If yes, how much? pan cuisine: that's great! Enjoy your mangoes while they last! 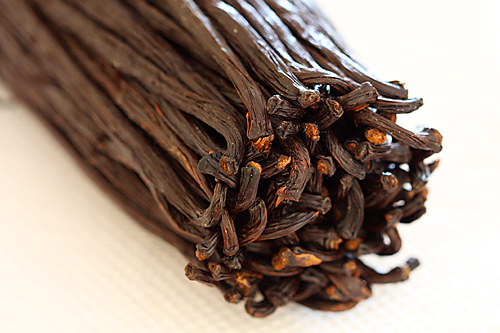 Gayatri: Yes ypu can use 1 tsp vanilla extract or a little more if you want a prominent vanilla flavour!